Hello Crafty friends, thanks for stopping by. Today starts a new challenge over at Crafty Sentiments Designs. This week's theme is anything but a card. I decided to alter a pizza box and I used Isobel-Seashell, she is so adorable. I am getting into the mermaid mood so this cutie was perfect to color up. I colored her up using my copics and I decided to cut her out using a stitched circle die. I used a paper stack that I had in my stash. I used some distress inks and a wavy stencil to create the water scene. 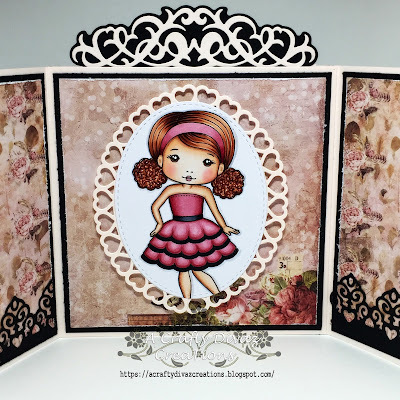 I layered a scalloped doily behind the image and cut out some bubbles using a die from my stash. You can't have a mermaid and underwater scene without the seaweed and starfish. So I die cut some seaweed and starfish out and added them around the image. I then added some pearls and the sentiment at the top. To add some dimension, I added nuevo clear drops for the bubbles. I am in love with this project, love the way it turned out. That's all I have for you today, don't forget to check out what the other lovely ladies created for this theme over on the blog. Thanks for stopping by and we will chat soon! Good Morning friends, Happy Monday to you. It's Memorial Day here in the states and we spend this day remembering those who served in our armed services. This is my last GDT post for La-La Land Crafts this month. I want to thank Irina and team for allowing me to the opportunity to share some of my creations using La-La Land Crafts products. Now on to my project this week. This week's challenge was to create something using three or more dies. I created a card using Heart Glasses Marci. She is so adorable with her heart glasses and balloon. I decided to use designer papers that I had in my stash to create this card. I stamped the image out on Hammill 80 lb digital cover card stock and colored her using my copics. I cut her out using my brother scan and cut. I added the stitched oval border to the top and bottom of the card. 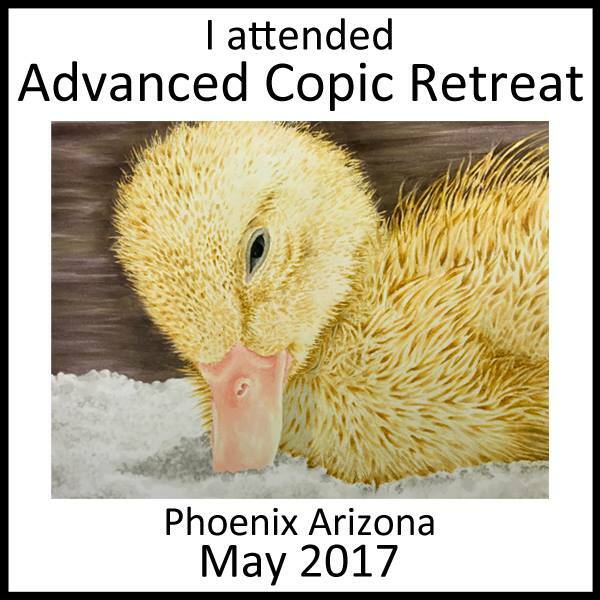 I used the pierced scalloped circle and nested circle die to place the image on. I also added two tags from the photo elements die set behind the circles. I also added the presents border to the bottom of the card as well. 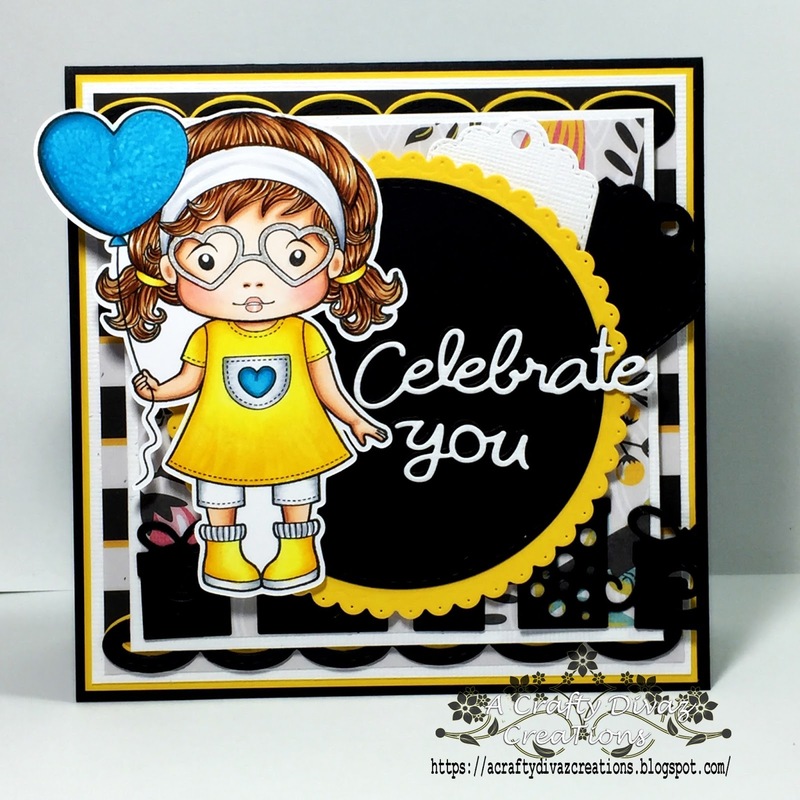 To finish the card off I added the celebrate you die sentiment. That's all for today, thanks for stopping by. Make sure you head over to La-La Land's blog to see what the other lovely ladies created. It's been fun, we will chat soon. Hello friends thanks for stopping by, hope your weekend is going well. 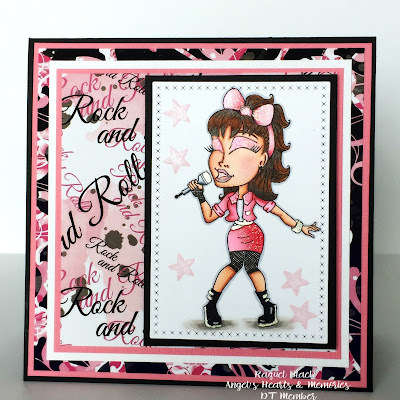 Today I am sharing a card using Rock Star Molly which is apart of Angel's Hearts and Memories new release. She is super cute and she looks like she is rocking out for sure. I used a digital paper I had in my stash that went well with this image. I colored the image up using my copics and cut her out using a lawn fawn cross stitched rectangle die. I popped the image up on foam tape and added her to the card. Check out Angela's etsy store to see the new release. You will not be disappointed. 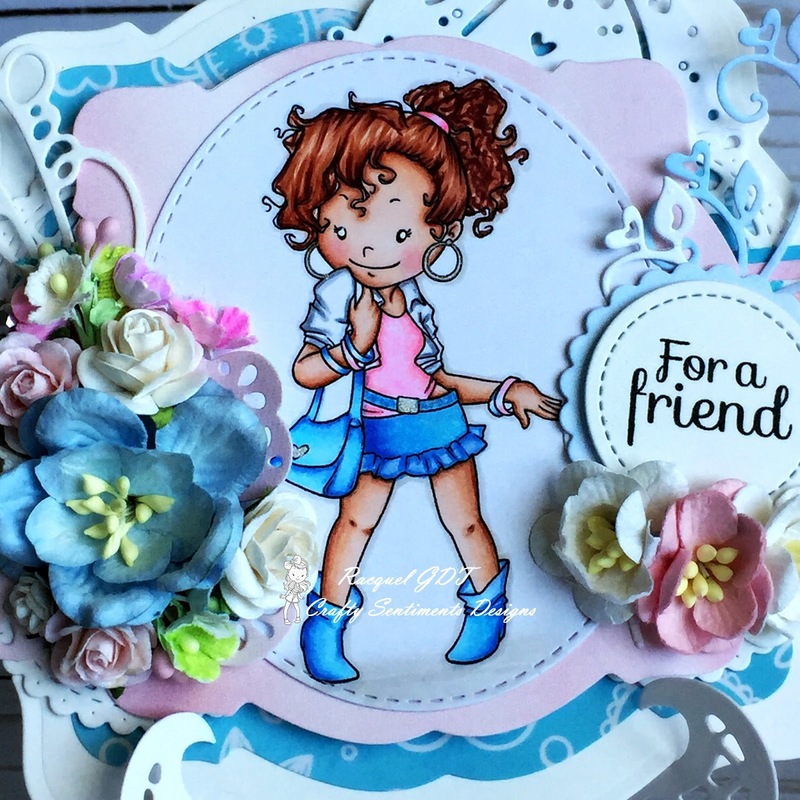 DOn't forget to share your creations using these cute images over on our Facebook page as well. That's all for today, thanks for stopping by. Have a great Sunday! Hello Friends, Happy Tuesday to you. This is my last GDT project for The Greeting Farm this month. I had an awesome time sharing some of my projects using The Greeting Farm super cute stamps. Today's card share features Fun Anya. The summer is just around the corner and and this cutie is perfect for those summer parties. 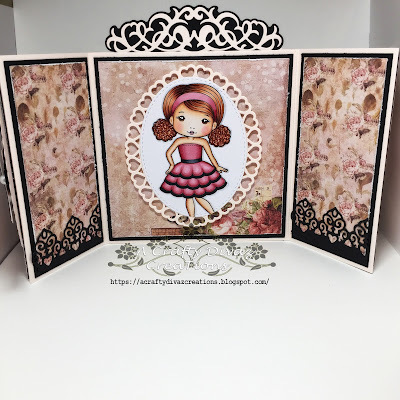 I created a square card using the Summer Dreams paper by Echo Park. I stamped the image out on copic x-press it blend card stock using momento tuxedo black ink. I used the accompanied die set for this stamp to cut the image out. I added her to the card along with a sentiment. I then added some enamel dots to the corners for added dimension. That's all I have for you today, I want to thank The Greeting Farm for allowing me to share my projects with you this month. It has been a blast, have a great Tuesday! Happy Monday friends, hope your weekend was filled with crafty fun. I am here to share my GDT project for La-La Land Crafts. This week its all about adding a animal. I decided to create a standing pop up card. I saw this on Pintrest and had to try it out. It is super fun and easy to put together. I decided to use Sitting Marci which you can find here for this project. She is super cute, I just love her. I colored her up using my copics and cut her out using my brother scan and cut. I decide to use the doodle bug spring time paper collection for this project. 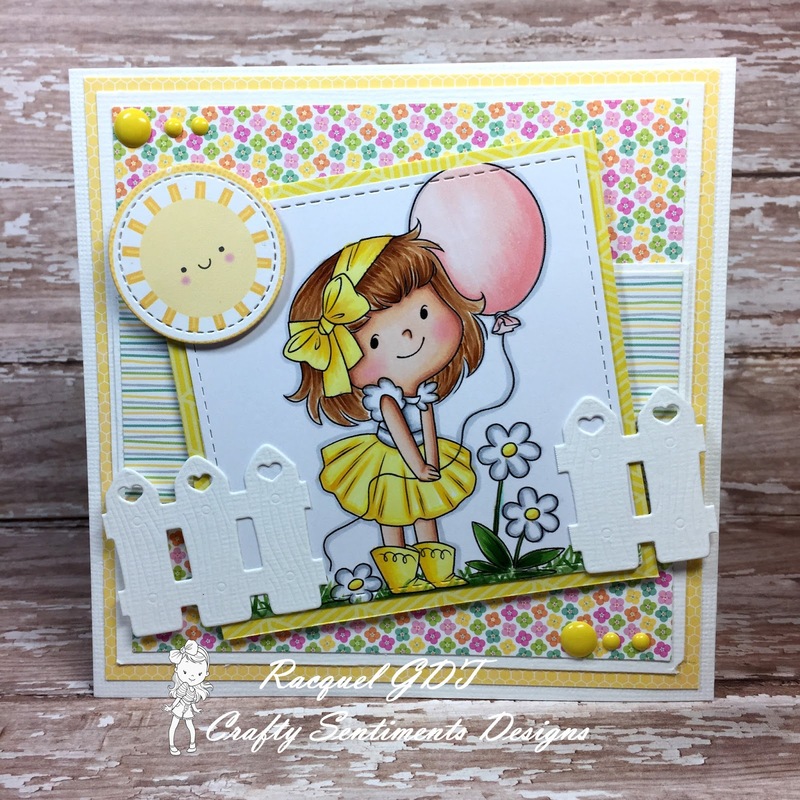 I wanted to create a tag so I used the pierced scalloped circles and stitched nested circles and added them to the top of the card. 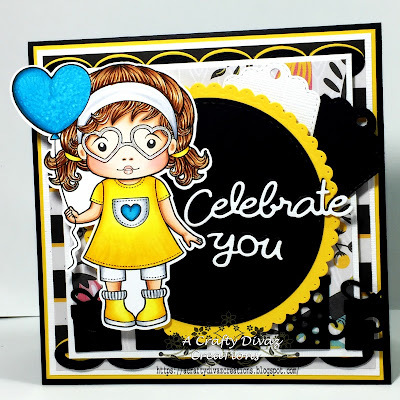 I used the sentiment from the Sitting Marci stamp set and cut it out using the label die from the stitched elements die set. I added the flower border at the bottom so Marci could sit on. Once the card is popped up, you will see a bear in a hot air balloon. This bear is from one of the club kits that I received this year. You can find more information on the club kits here. I love the way this card turned out! I am definitely going to try this card project again. Thanks for stopping by today, hope you have an Awesome Monday. Hello crafty friends, Happy Tuesday to you. It's a new challenge over at Crafty Sentiments Designs blog and this week's theme we are using Pastel colors. For this card, I am using Teenage Fashion which you can pick up in the store here. She reminds me of a friend of mine's daughter, cute and sassy. I created a shaped card using a die from Go Kreate. I added digital papers from my stash that was perfect for the colors. I colored the image using my copics and cut her out using a stitched oval die from CC Designs. I layered some die cuts from my stash around the image and I used a altered stick pin to add as well. I used wild orchid crafts flowers using the color palette around the image. 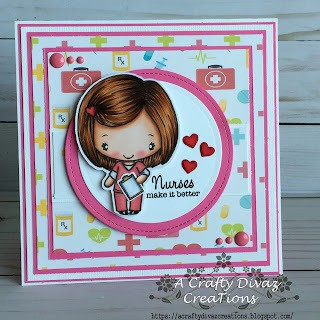 I cut out the sentiment using a stitched circle die and layered scalloped circle from Lawn Fawn to the card. I love this image and I love the way this card turned out. 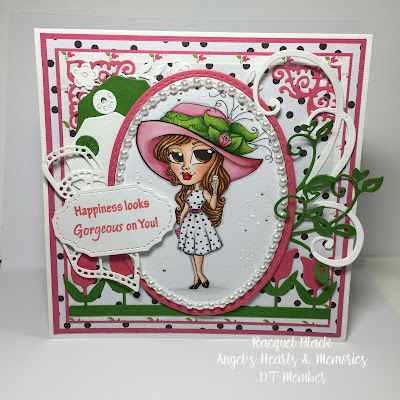 Check out the blog to see what the other ladies created using this theme. Don't forget to check out the Facebook page as well. Thanks for stopping by, we will chat soon. Have an awesome day! Hello friends, hope your weekend was fabulous. Sunday was Mother's Day here in the states so it was a pretty busy day for my family and I. Now I just need one more day to rest, lol. I am back with another GDT project for La-La Land Crafts. 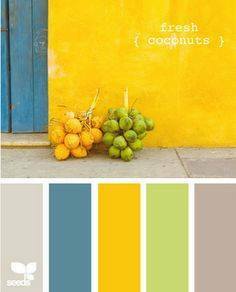 This week we are using a photo as our inspiration to create our project which is below. I decided to create a easel card for this project, I used Echo Park Summer Fun digital papers to create this card. I stamped Sun Fun Marci out on copic x-press it blend card stock with momento tuxedo black ink. I used my copics to color her up and I cut her out using my brother scan and cut. I added the Sunburst Border Die to the top of the card. I then used the Postage Stamp die cuts to layer behind the image. I layered the lighthouse die and palm tree die cuts behind the image as well. 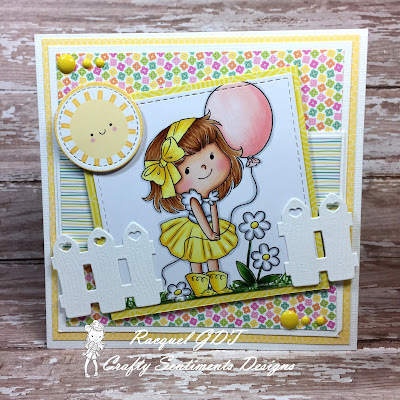 I added the postage die as the card stopper and used the sentiment from Summer Fun Marci stamp set. 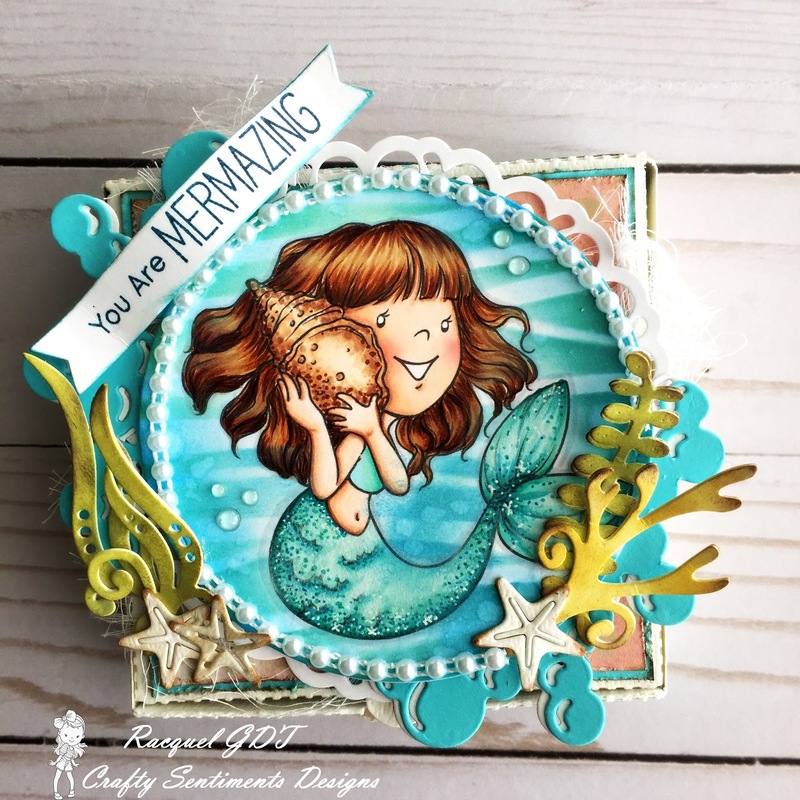 I finished the card off by adding the seashell border. Check out what the other ladies created using the photo inspiration over at the La-La Land Crafts blog. Don't forget to join us over on Facebook page and share your La-La Land Crafts creations. Thanks for stopping by, have a fabulous Monday! Hello Friends, Happy Tuesday! Did you know this week is Nurses Week? To celebrate, I decided to create a card using the digital stamp RN Anya. 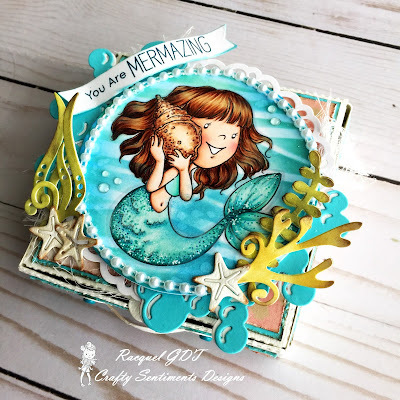 I used a digital paper pack that I had in my stash, it was perfect to create this card. I printed the image out on copic x-press it blend card stock and colored her up using my copics. I cut her out using my brother scan and cut and layered her on two circles die cuts from my stash. 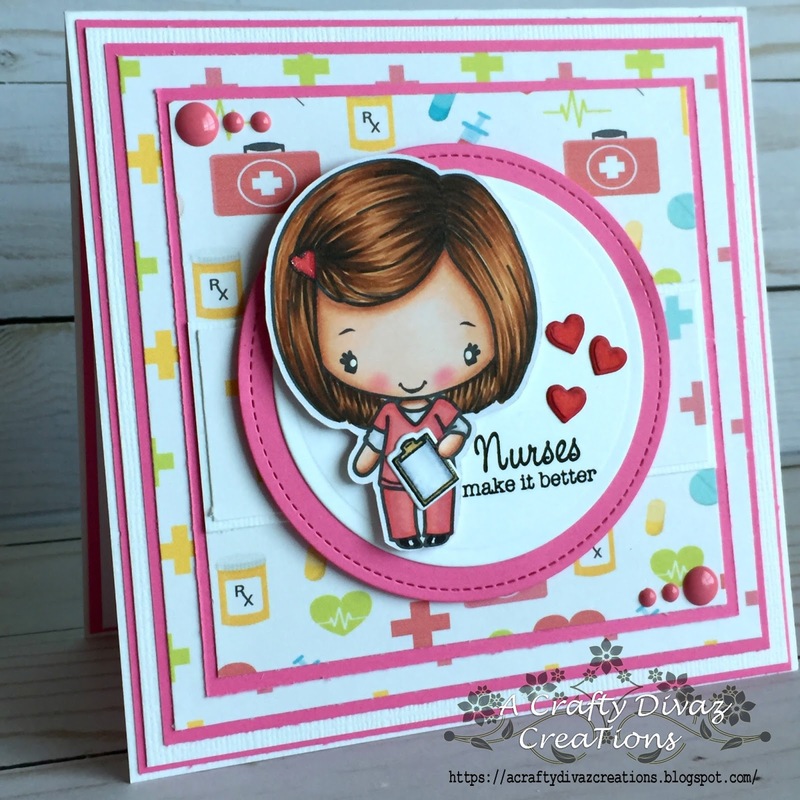 I added the clipboard from the Get Well Soon stamp set and die cut it out using the coordinating dies. 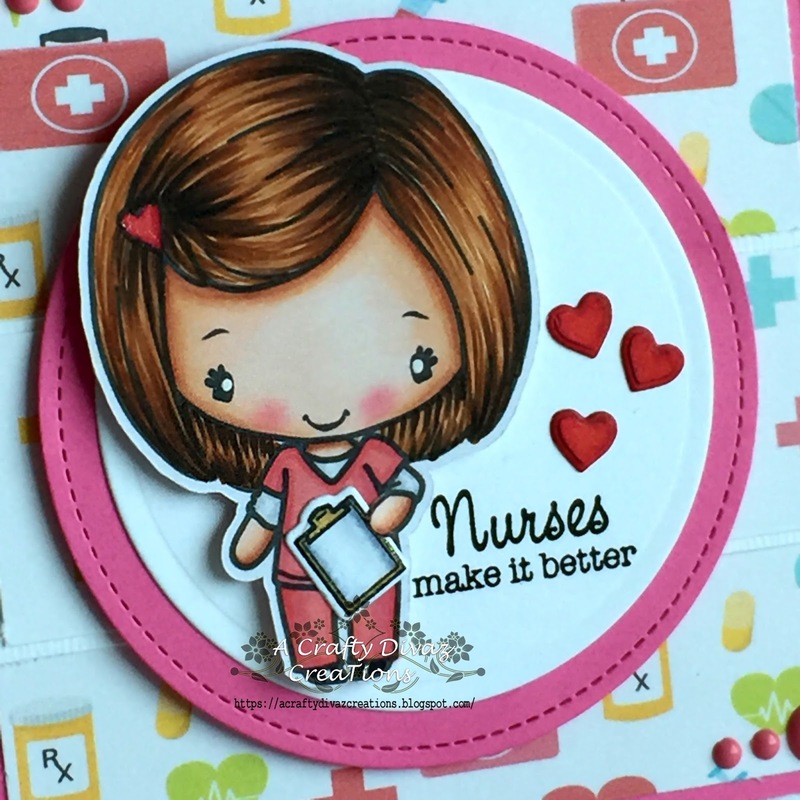 I then added the sentiment that is also fro the Get Well Soon stamp set. I added some enamel dots to finish the card off. I love the way this card turned out, and I love RN Anya. That's all I have for you today, if you know someone who work in the medical field please don't forget to thank them for their services. Have a fabulous day! Hello Crafty Friends, Happy International Scrapbook Day!!!! Hope you get some crafting time in today, I will be enjoying some crafty time. I love this time of the year, there are a lot of crafty sales going on and several crops to get me inspired to create. 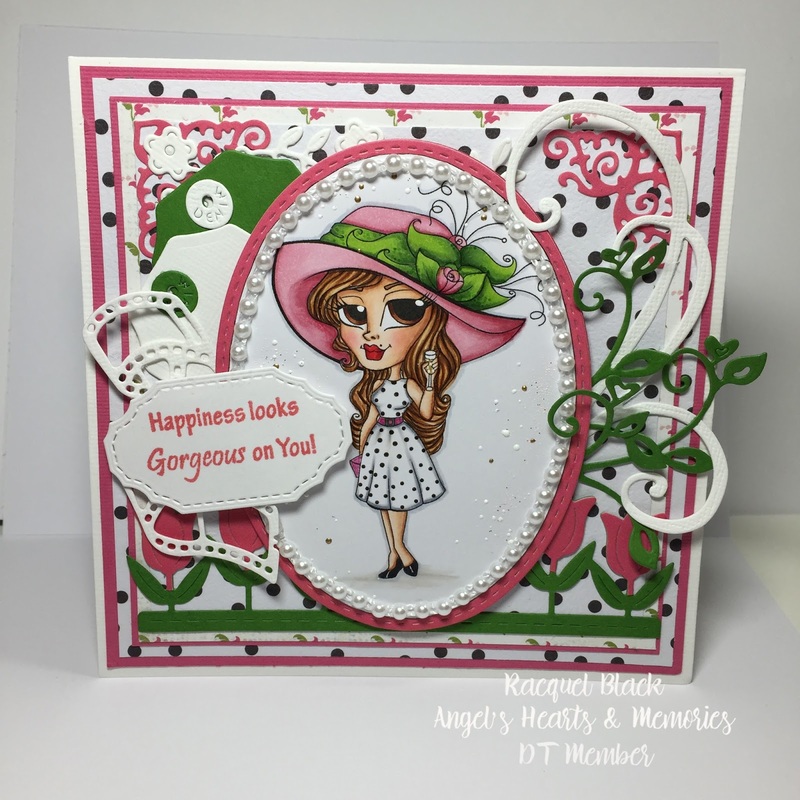 Today is the Kentucky Derby and I am showcasing one of this month's new release Kentucky Derby Debra from Angels Hearts and Memories. Every year, I try to catch the Kentucky Derby on TV just for the fashion. Kentucky Derby Debra is ready to make a statement at the Derby with her hat. I printed the image out on copic x-press it blend cardstock and colored her up using my copics. 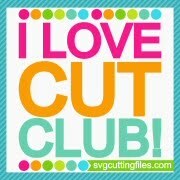 I cut the image out using a oval die from my stash and added a stitched oval behind it. I then added some frontage around the image along with fallback pearls. I used designer papers from my stash to coordinate with the image. I layered some tags behind the image along with a couple of flourishes. I then added a flower border to the bottom of the card. I added the sentiment from my stash to the card that I think was perfect for this image. That's all for today, hope you enjoy this card. Check out Angel's etsy shop for this and other cute images. Have an awesome International Scrapbooking Day! Happy Crafting! 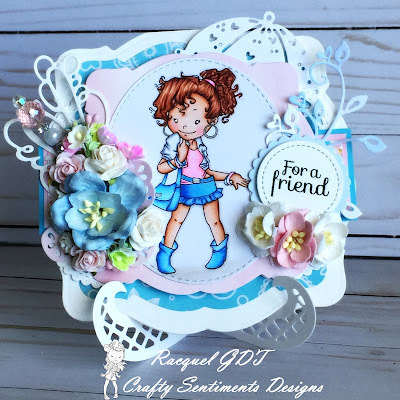 Good Morning friends, I have a second post for today and its Crafty Sentiments Designs Anything Goes Challenge. Today's card is featuring Simplicity which is apart of this month's new release. She is so adorable with her cute balloon. Since this was anything goes challenge, I decided to keep this card fun and full of bright colors. I colored the image up using my copics and used a stitched square die to cut the image out. 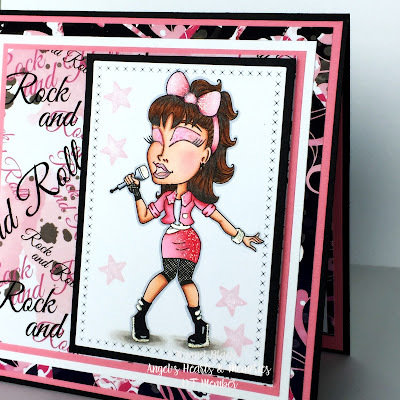 I used designer papers spring things by Doodle bug to create this card. These papers scream fun and cheery colors. I cut out the sun from the paper pack using a stitched circle die and added it to the card. I die cut a fence and added it the front of the card as well. To finish the card, I added some enamel dots to the card for added dimension. 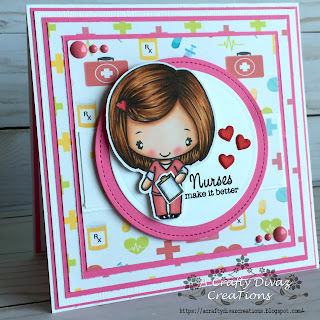 Check out Crafty Sentiments Designs Challenge blog to see what the other amazing designers created this week. Join in and share your creations with us, we would love to see what you create. You can also check out our Facebook page here. Thanks for stopping by and have a Great Tuesday. Hello crafty friends, I hope you are having a wonderful Tuesday and its off to a great start. 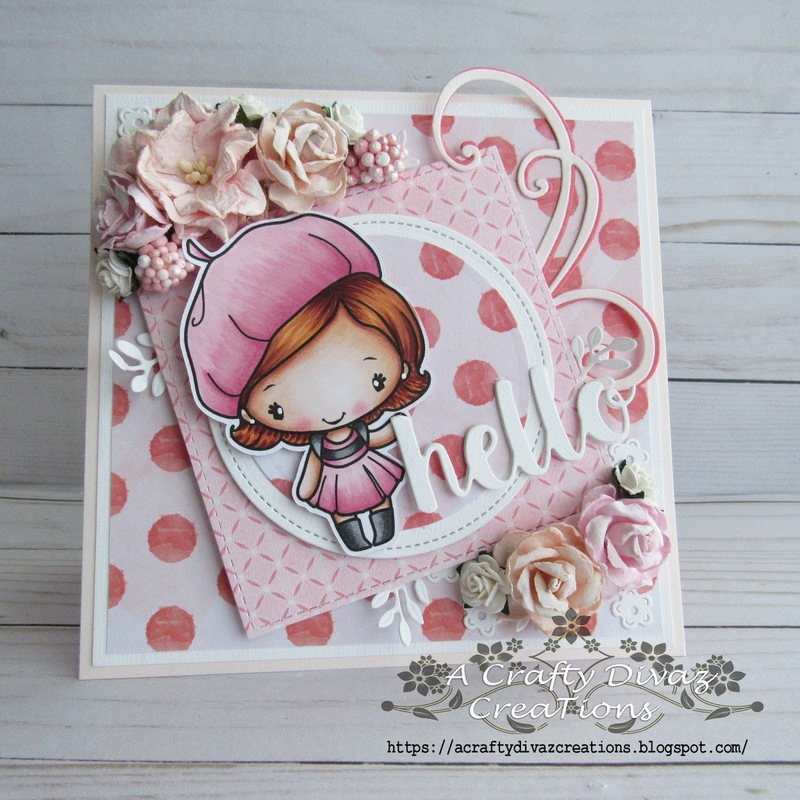 I am super excited to be a guest designer this month with The Greeting Farm. So without further ado, let’s get this party started! 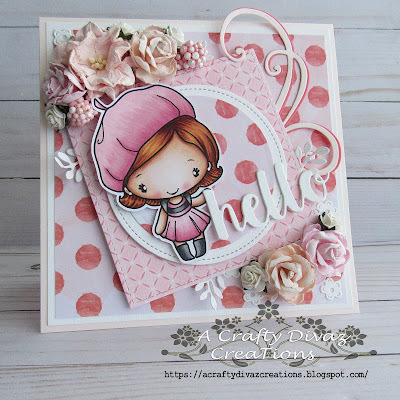 I decided to create a cute card using the digital stamp Bonjour Anya which you can pick up in the TGF store today. I colored the image using copics and cut her out using my brother scan and cut. I cut out two circles from dies I had in my stash, one being a stitched circle to layer the image on. I then cut out a stitched square and added it to the card as well. I cut out the word hello several times to give some added dimension. I then added some wild orchid craft flowers around the card to finish it off. I hope you enjoy this card and it provides you with some inspiration. Thanks for stopping by, check out The Greeting Farm store for this and other cute stamps. Head over to the Facebook page and share your creations with the group. Have a great Tuesday! Good Morning crafty friends, its Monday which means the weekend just flew by. Hopefully you spent time with family and friends or even got some crafting in. I was able to squeeze a little bit of craft time in, its been a bit crazy around here the past week. Well on to my project today, which I am super excited about. I am guest designing for La La Land Crafts for the month of May. EEEKKKK, I am soooo excited about this opportunity. Over the next month, you will see projects using the super cute La La Land Crafts stamps and dies. This week's challenge is Anything Goes, so I decided to use Marci with a Rose on my card. 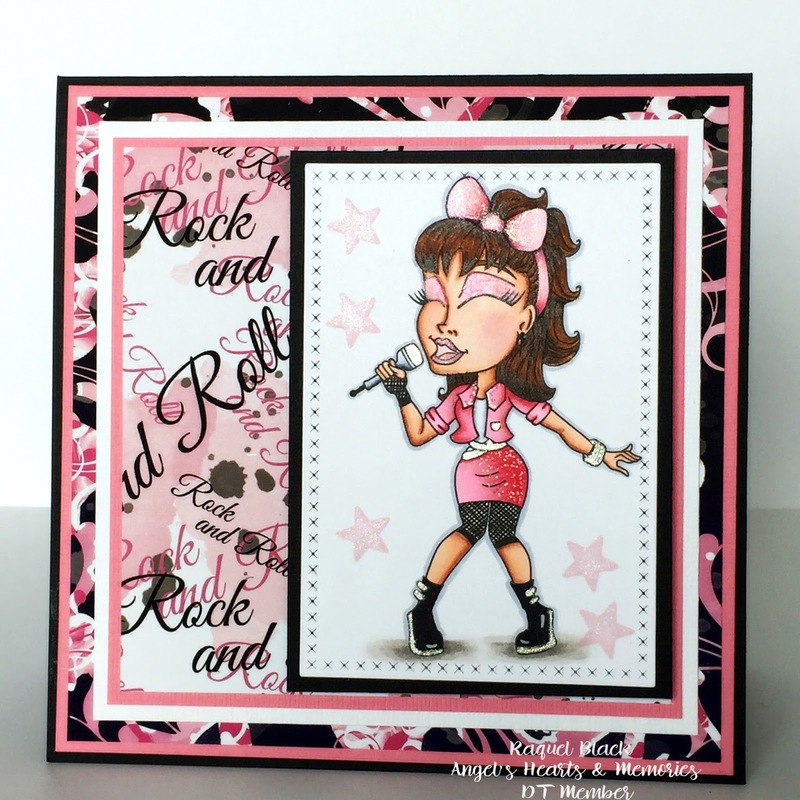 She is one of my favorite stamps to create with from LaLa Land Crafts. I needed to make a birthday card for a friend so this card was perfect. I stamped the image out on copic x-press it blend card stock and colored her up using my copics. I decided to use DSP from My Mind's Eye called My Story. I cut out a pierced scalloped circle and stitched circle dies. Both from La La Land Crafts and added them to the center of the card. I then cut out two open leaves and added two filigree flowers from La La Land Crafts. I cut the image out using my brother scan and cut and added her to the front of the card. I definitely loved the way this card turned out, I say that about every card but this one is speaking to me, LOL. Thanks for stopping by, hope this card brought you some crafty inspiration. Check out the La La Land Blog to see what the other amazing ladies have in store for you. Don't forget La La Land Crafts have a Facebook group where you can show us your La La Land Creations. Head over and check it out, you will see lots of inpisration for sure. That's all I have for you today, thanks for stopping by and have an awesome Monday!